You should never back a horse until you have checked whether or not it is a non-runner. Betting on horse racing is fun and exciting, and sometimes the excitement can lead to the overlooking of some important information. There are horses that withdraw from the race due to various reasons even after being placed in the betting markets. This can either occur late or early depending on the circumstances and punters should be very careful. It is essential to check the day’s non-runners when they were withdrawn from the market and the reduction factor. The horse racing non-runners could be for the flat turf races or the all-weather races only. The name of the horse, the trainer and jockey are important facts that will help you recognise a non-runner. There is also the case of doubtful horses which are kept in the race on a certain condition which if not met, the horse withdraws. What is the Rule 4 Deduction? A Rule 4 deduction can be utilised if there is a non-runner after you have taken a fixed price or if you are backing at SP and a horse is withdrawn late from the race. This is applied to the stake amount such that it is decreased to show the better chance you have since a competitive horse is not running. The rule 4 deduction is meant to settle the horse racing non-runners issue, but it does not do this conclusively. It is always better to keep your ears on the ground and know the race you are betting in. Who are the Non-Runners in Champion Stakes? The substantial amount of rainfall that fell in the south of England has made the Champions Day at Ascot even heavier. The issue of deep ground has yet again led to the withdrawal of another big name The Grey Gatsby although seven supplementary entries were made. Kevin Ryan, who is the trainer, said that the horse would not participate because of the excessive softness of the ground. The horse has previously been left in the race at the 5-day entry stage after the trainer said that the horse would line up if the ground dries up. Hence Grey Gatsby is certainly a non-runner. Clive Brittain also declared that Rizeena would not participate in the Champion Stakes. This is also due to the softness of the racing surface. The news about these horses has been tough for the lovers of the sport. The more the horse racing non-runners, the more uncompetitive the race becomes and this is not a good thing for the fans and the punters as some of their favourite horses miss out. 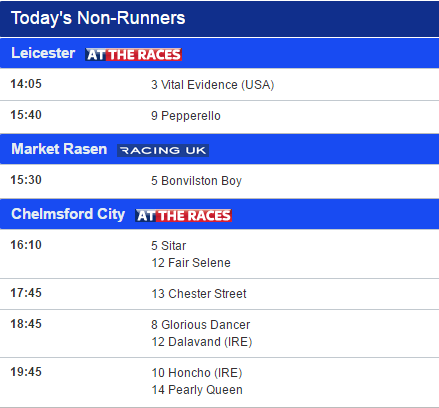 Moreover, there are other horses that are non-runners in this leg of the Champions Day. Taghrooda and Mukhadram have announced their retirements ahead of this competition. Also, jockey Kirsty Milczarek was forced out due to a long-term neck injury. Charlie Bennet, on the other hand, was taken to hospital after falling hard in Windsor and is less likely to participate in this race. Wise Dan is also out due to an ankle injury that will keep him out of the Breeder’s Cup. 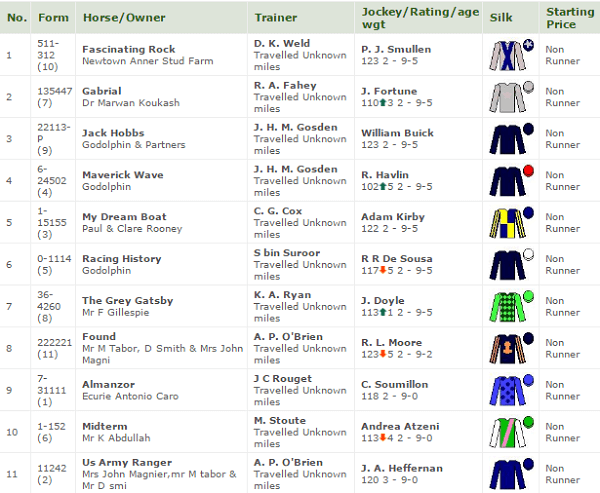 The 7 supplementary entries include the Group One winner G force in the sprint. Pether’s Moon, who has only had success at Group three level, is 6th in the betting odds, and this displays the shortage of quality. The non-runners have reduced the excitement and the competitiveness of the race, but the anticipation is still there. This year’s race may end up being the best ever witnessed regardless of the situation. The Salisbury meeting on Monday was declared impossible due to a rather similar amount of rain, but Stickels confirmed the Champion Stakes cannot be cancelled on the basis of weather since Ascot can still host a race despite the surface conditions. He sees a prospect of the ground drying out to become soft if there were a number of consecutive dry days. However, the forecast has shown light showers on most of the days; the racing surface will remain as it is. Ascot has done away with the idea of putting up rain covers at the track and has opted to run this year’s competition on a new inner course. The rain covers are not viable since their construction and taking down is quite time-consuming and any rain that falls during the latter process would destroy the surface beating the logic behind the construction of the covers. Also, there were potential waterlogging and drainage problems that would arise from the idea leading to extra costs. The new course seems to be the most viable option. Running rails would be put to create a track hoping that the race will take place on a better racing surface since the ground will not have been watered. This would also decrease the importance of the draw for the ten furlong Group One event. This solution has been approved by both Qipco and Ascot. Riders such as Ryan Moore have also endorsed the idea further adding that it will go a long way in improving the quality of the race in the future. The Champion Stakes is one of the biggest horse racing events, and the weather problem is jeopardising the quality of the race. The withdrawal of big names from the race has always caused a decline in the competitiveness of the race, and this makes it less exciting. The horse racing non-runners are a sad occurrence that can happen to any horse race. The sport needs all the competitive horses in one arena to battle it out for the top spot. The Champion Stakes has lost its excitement and competitiveness due to the withdrawal of the big names, and this problem should be sorted to avoid a similar occurrence next year.